They arrived in Santiago in the rain. “If you haven’t been to Santiago in the rain, you haven’t been to Santiago,” said Helen, smiling as she repeated what Jeanne had told her in one of their first conversations about the Camino. So, indeed they had arrived. It had rained their entire last day of walking. 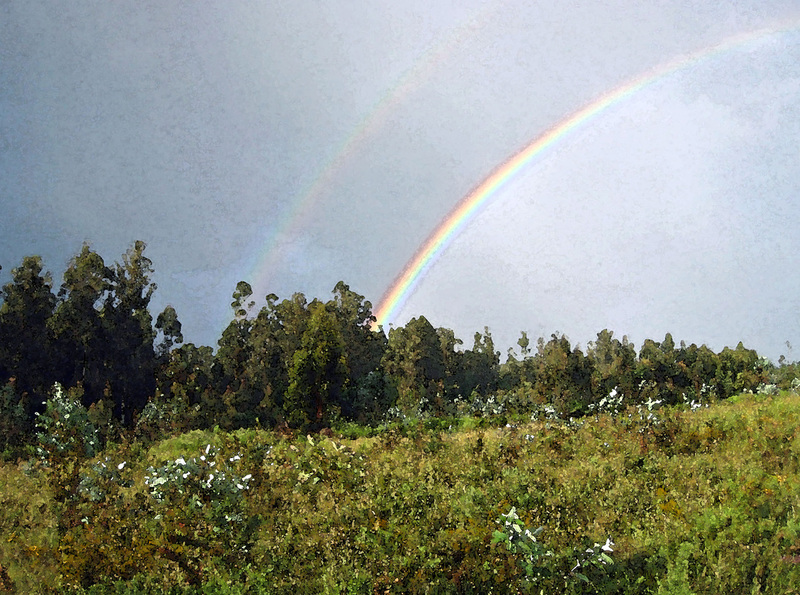 She found the scenery to be unremarkable, except for a triple rainbow overhead as they were in the vicinity of the airport and approaching the city. Somehow that captured the day’s feel—anticipatory and beautiful in a highly elusive way. Near the edge of the city they had posed at a stone monument announcing arrival in Santiago while a helpful stranger snapped their picture with Bert’s camera. The image on the camera’s small screen showed them rain streaked and bedraggled and was neither a great photo nor flattering to either of them. But Helen didn’t care. They were smiling. The picture accurately reflected her joy, and how at peace she felt with their togetherness today. They continued through the outer and inner suburbs, and were soon in sight of the looming spires of the cathedral. Winding through the streets of the old city, she was surprised when they suddenly arrived in the Praza de Immaculada and caught sight of the northern façade of the cathedral. It was early, not yet eleven in the morning, and they were here already. The plaza was immense, perhaps a hundred yards in each dimension, and this was only one side of the cathedral. The structure’s Baroque ornateness was decorated in lichens and moss on this north-facing side, she noticed. They stopped near the center of the wet plaza. She had expected from the accounts of seasoned pilgrims that she would have mixed emotions about arriving here. It was true. She was sorry it was over, even though she was happy they’d made it all the way. 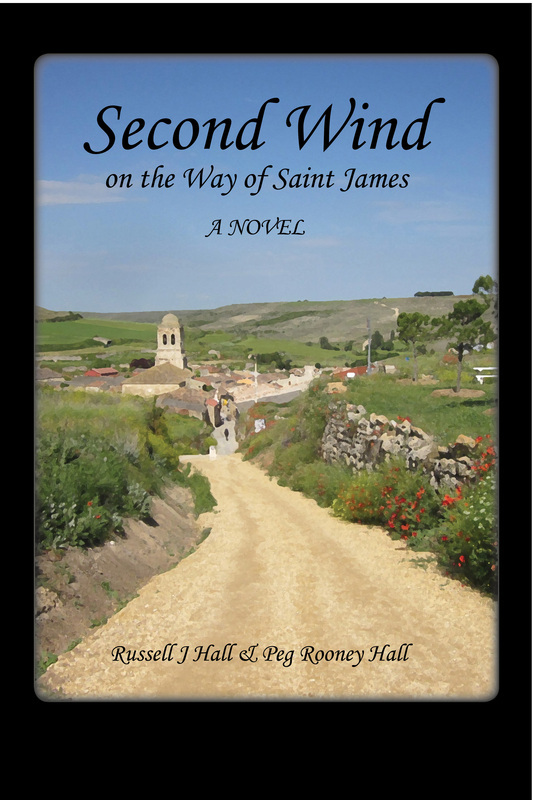 But even the looming end of their Camino could not dampen her pleasure at their new closeness. They looked at the cathedral, looked at each other, smiled, and dripping ponchos notwithstanding, hugged each other tightly and long. Other pilgrims stood in the square, either singly or in small groups. The two of us are alone in this vast plaza, she thought, but we’re here together with all the others who are sharing this experience with us. She squeezed his hand. Pigeons waddled around their feet, undeterred by the gentle rain. “Is your ‘now what’ an operational question, or a metaphor?” Helen asked, reviewing several options. They could set about looking for some lunch, check into the room he’d reserved in the monastery, or visit the cathedral. Or, answering the more metaphoric question, now that they had finished the Camino, they could start figuring out how to replace or recreate it. Most importantly, she thought, how to live with its lessons? They moved together to a bench, slipped off their packs and settled for a moment, watching the pilgrims milling around in the rain. “How can we hold onto this quietness of mind? How can we hang on to the feeling that makes it okay just to be doing what we’re doing and not having anything else to do?” She asked it with a happy sigh. Bert apparently shared her thoughts. “Okay, now that the walking itself is over, we need to never let the spirit of Camino escape. I think the rigors and routines of the physical journey are what made the peace of mind possible. Each day we’ve walked—well, not counting those first few miserable ones—I felt the clutter in my life slipping farther away and what matters most to me coming better into focus. “That’s an ambitious agenda! We better get going,” said Bert. “Let’s wait and see if we like it. Maybe the renovation is so badly needed that we’ll wish we’d reserved somewhere else,” Helen replied. They found a man behind a window near the main entrance. He was sitting in a room not unlike a ticket booth and seemed to be dispensing keys. Working together to find a few of the right words in their still-not-good-enough Spanish, they somehow got across to him that they would be staying at the monastery and were ready to check in. They sat on the narrow wooden bench he indicated, pulled off their ponchos and placed their packs and walking poles on the stone floor. Damp and chilly, Helen realized she was tired despite the early hour. Bert put his hand over hers on the bench and it warmed her. She thought this must be a cumulative fatigue from all their days of walking. Both stared ahead, just relaxing together without speaking. A stream of people entered and left the monastery. Most seemed not to be pilgrims. Maybe they were tourists, or locals. Nevertheless she felt a certain kinship with them. The nun—Helen wasn’t certain she was a nun, but guessed that she must be—appeared after a seemingly long wait that was probably less than thirty minutes. Unlike the last time a nun checked them into a monastery, Helen felt at ease. And she noted no tension in Bert as they followed the nun up the six stone steps and through the massive wooden doors leading from the vestibule. If the woman knew any words of English, she wasn’t letting on. Nevertheless, she seemed adept at sign language, and without a word led them into the maze that was the monastery, walking through a massive cloister as they navigated to the corridor that led to their room. On the way she asked Bert a question in Spanish. He seemed not to get the gist of what she was saying. Fortunately, Helen had overheard, and surmised that she was asking whether they would be taking breakfast at the monastery. Once the question was translated, both answered affirmatively. Flipping a wall switch that dimly illuminated a long hall with dark wooden doors with transoms over them, their guide stopped at the second door on the left, put a long, old-fashioned key in the lock, and departed, after indicating—again by easy body language—that the room was theirs. The dim lighting and dark wood of the place reminded Helen of her high school. They had not been asked to provide payment, to sign anything, to leave passports, or to do any of the other things they were used to dealing with when they checked into lodgings. The room was spare, but had all needed features. To start with, it had a matrimonial bed. She nodded at it, catching Bert’s eye. “Well done, Bert,” she said. He smiled at her, as he too glanced toward the bed. There was a private bathroom with toilet, shower, and thin towels no one would call fluffy. A tank hung on the wall above the toilet. To flush, you pulled the chain on the tank. It was noisy, but worked. Though far from cozy, the room was warm enough, and had adequate floor space and other flat surfaces to accommodate their clothing and gear. A floor-to-ceiling window stood in a deep alcove with a stone bench along each side. Its dark wooden shutters matched the window sashes. They put down their packs and poles. Coffee was still calling to them, but the warmth of the room won out over it. “I think we’re lucky to have come before the renovation,” Bert said. They hung up their wet ponchos and lay their damp shirts and pants on the radiator. He stretched out on the bed and gestured her down next to him. He grabbed the blanket folded on the bottom of the bed and pulled it over them against the damp cold. Having him close was a wonderful feeling. Relishing the feel of their bare arms and legs touching, she relaxed against him. Later would be less relaxed and even warmer, she thought and smiled to herself. Now, she delighted in their anticipatory midday nap. The rain had stopped at least for the moment and they walked to a café-bar overlooking the two-tiered Praza da Quintana on the east side of the cathedral. They watched the pilgrims in the plaza while waiting for their pizza and café con leche. But the call of being together back in the monastery made for a quick lunch, and then a lovely long afternoon. Hours later, in twilight, they ventured out in the humid air. They found a cozy restaurant and ordered a nice, decidedly non-pilgrim dinner featuring local seafood. The wine arrived quickly and seemed especially good tonight. “You know, I think Santiago is not the ending,” Bert said. “It’s the beginning of something—the beginning of a new camino . . . and the new us. This afternoon, tucked snug in our room, safe from outside forces, I felt a sense of intrigue about the future. I can’t remember the last time I felt that way”. After the waiter brought their ensaladas mixtas, Helen picked up the conversation. And if it handed her a couple of years in Washington, she felt confident Bert would like having her there, where they could spend more time together. That idea pleased her. If headquarters insisted, there would be a way to make it work. She was grateful they were in the kind of restaurant that expects you to take all evening to eat and even to stay and relax after your meal. She was sure their waiter wouldn’t even think of hurrying their evening. They watched and smiled as he set a plate of mixed cheeses and chorizos before them. Bert ordered a new bottle of wine. “Let me pour us some more wine before I tackle that one,” said Bert. He raised his glass to her. When they had finished their wine, he reached for her hand. They paid up and walked out. The moon had disappeared and the rain had returned. Beyond talked out, they crossed the plaza leaning into one another in comfortable silence as they walked to the monastery. In the quiet she felt they were trying to get a sense of their unfamiliar new souls. They woke to another rainy day, their second and last in Santiago. They joined other monastery guests in the basement dining room for a modest meal of coffee, bread, cheese, and thin slices of meat. They didn’t stay long, however. They had two goals for the morning: to get their Compostelas at the Pilgrim Office, and to go to the mass at noon at the cathedral. They hoped to bump into some of the other pilgrims they’d met along the way. Fully expecting a long line of people waiting to show their passports and get their certificates of completion, they stepped into a short one. It did snake up the stairway ahead of them, but they did not have to stand outside in the rain to wait. It was early and today’s arriving pilgrims were still on the trail, so they waited only with those who like them had come in yesterday. They scanned the crowd for familiar faces but didn’t spot any friends ahead of them. When their turn came, after thirty minutes of inching up the wide, stone staircase behind those who had arrived earlier, they stepped before a long desk. Each faced an official who examined pilgrim passports to ensure that they had stamps to show they’d walked at least the required one hundred kilometers. They answered a series of questions to give the office data on what country they were from and why they were walking the Camino. They walked out with their Compostelas ornately inscribed in Latin, and stowed in cardboard tubes so they could arrive home unwrinkled and ready for framing. As they started back down the steps, there waiting in line were the Spanish brothers Oscar and Ernesto. They had handshakes for Bert and hugs for Helen. They all promised to watch for each other later when they weren’t holding up traffic on the stairs. They had been at the Pilgrim Office less than an hour and still had some time before mass. It wasn’t raining for the moment, so they grabbed the opportunity to walk through all four plazas, on the four sides of the cathedral. Beginning on the south side near the pilgrim office, they walked past the fountain with horses jumping out of water which Federico García Lorca nicknamed "The Fountain of the Dream" in one of his poems. On the east side, they walked slowly up the broad bank of steps separating two plazas, the square of the dead, below—once apparently the site of a cemetery—and the square of the living, above. Just past the bar where they’d had pizza yesterday, they entered their own Praza de Immaculada, in front of the monastery. A string quartet—two young men and two women—was playing in the center of the square. The sign before the musicians indicated they were from Russia. They ended up on the west side in the Praza do Obradoiro and asked a young man to take their picture. This was the scene featured in all the guidebooks, and each wanted a good copy to hang when they got home. Barely out of earshot of the string quartet, they heard harsher musical notes, and spotted a man playing Galician bagpipes. They saw the Hostal de los Reyes Católicos on the north end of the square. It had been hosting pilgrims since the Middle Ages and now had become so upscale that it didn’t interest Helen at all, not even just to peek inside. She got no argument from Bert about foregoing a visit. Having circumnavigated the whole cathedral, they entered through the west doorway. They found the Tree of Jesse, a column where for centuries pilgrims had placed a hand, and noted the indentations all those hands had made in the stone. Recently it had been covered by a clear plastic shield for the column’s protection. They watched as pilgrims filed up a stairway that led past the back of the statue of St. James above the altar and, following tradition, placed a hand on its shoulder. Neither of them was inclined to join in the ritual. 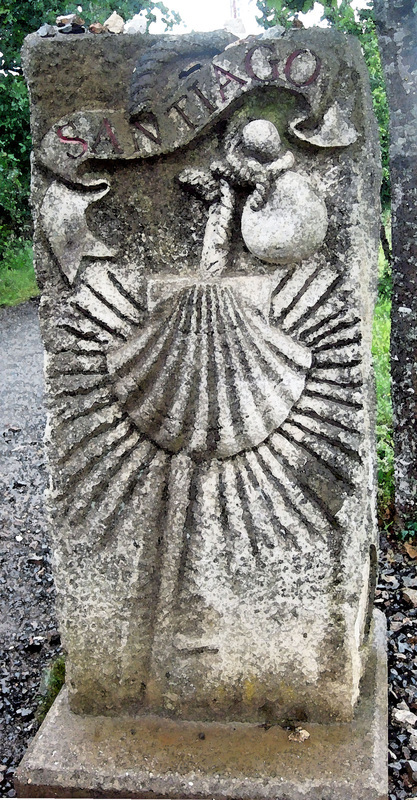 Earlier Helen had decided she preferred Romanesque simplicity, but, after all, this was the end point of the Camino. She wanted to build a memory of the cathedral that would last. It helped her to have read that the structure was built following a simple Romanesque design, but in later centuries exterior faҫades and the interior were decorated with the complex flourishes of the later Gothic and Baroque architectural styles. She was quite sure no photos would tell the ornate tale adequately. They had arrived at the cathedral a full hour before mass was to begin, and spent a half hour on their little tour. That was enough for them. By then the building was already filled. They stopped in the entry of the north transept where they thought they might be able to see a bit of the mass. Across the crowd, thankfully far away, Helen spotted Trudi and Heinrich, the Friend Collectors, and pointed them out to Bert. When the mass began, they could hear everything. The cathedral was equipped with excellent electronic acoustics. Only rarely, however, could Helen see the celebrants through the crowds. They remained until the mass was over, and remarked as the crowds were filing out that neither had found special interest or inspiration in the service. It just felt right to be there, where centuries of peregrinos had been before them. Helen felt a hand on her shoulder and turned to find herself looking into Ilsa’s big grey eyes. They hugged, and then Bert said he wanted a hug too. Never a natural hugger herself and certain that Bert wasn’t one, Helen marveled at how their Camino experience seemed to be converting both of them. He asked Ilsa how the final days of her Camino had gone, and her eyes smiled along with the rest of her face. She said she could not really have asked for more from it. As they walked out together, Helen surprised herself telling Ilsa that she thought she and Bert had perhaps begun to find the walls of their cages and push them down. Ilsa wished them well as she hurried off to catch a train to Madrid. They slipped into a café and ordered a coffee to drink while they watched the rain that had begun again just as they left the cathedral. Helen pulled her eyes back from the window where she’d been watching the pilgrims going in and out of the cathedral. She put down her cup and looked straight at him. “Right. My Spanish.” He raised his coffee cup and clinked it against hers. She held his blue eyes in her gaze. “Back to the point.” He sat back in his chair. Helen’s eyes still were shining as she looked over the cup in her hands and smiled. “Ha! I haven’t thought of that saying in a long time,” she said. “Honestly, the minute I read it I realized that I have to be the one responsible for saving my own life―for figuring out how to stop looking at the future as an abyss and start making it a place I want to be. The scary part was, at the Cruz de Ferro, I realized that all along I had been hoping you would find a way for me to avoid that abyss. And you weren’t doing it. “I have to say that your facing some of those demons is one of the keys to my happiness right now. I was afraid that if you couldn’t come to grips with your fears and couldn’t trust yourself more, our friendship might not make it. I couldn’t bear the thought of leaving it, and you, behind. But, instead, the Camino worked its magic on both of us. You really have changed too,” he said. “Come on, Bert. I don’t think I have changed much at all—other than that business about your bed, I mean.” She pushed the hair back from her eyes. It was getting too long after all these weeks. “Hmmm, I hadn’t thought about them that way. Yeah, maybe,” Helen replied. “It could be my first assignment for our future.” She laughed. “Oh no! Assignments already! Could you stop being so organized!” Bert laughed too. They finished their coffee and decided to visit the small museum in the cathedral. They had learned it was the only one open during siesta, and they would try to make it last through a good part of the afternoon. Then they would rest, together. The laziness of Santiago in the rain, the fatigue born of day after day of relentless walking, and the magic of the Camino-induced changes in their lives called them to celebrate. Later they were again sitting on one of the benches in the monastery’s vestibule, hoping to catch the nun. They owed her at least sixty euros, and Bert said he was afraid they would have to leave Santiago before they found an opportunity to pay up. After they saw her, they needed to find an Internet café so they could proclaim their success to their friends. Helen was pensive. “Despite what I said earlier about not letting the changed Bert and Helen fade away, I’m a bit afraid,” she said. A cluster of children, probably a middle school class, filed into the monastery, leaving a trail of wet footprints on the gray stone floor. When they disappeared into the interior, Helen continued. "The point," she said, "is that once you have taken apart and analyzed something magic, it isn’t magic anymore." “If you’ll help me, I’ll help you,” Helen said. Their plane for Madrid would leave at ten the following morning. I think I have begun to figure out what’s different and what I want to be different. Let’s plan a getaway weekend together, okay? I need some sister time with you. Subject: Final Camino Report SANTIAGO! We made it! We have walked 790 kilometers, which is roughly 490 miles, and we are now in Santiago de Compostela. It took us 43 days, which calculates to nearly 11 ½ miles a day, counting our rest days. Our bodies may never recover. And you, dear friends, may never recover the same old Bert and Helen you knew and loved so well.